Locations makes it possible to segregate ads by place or city. Thanks to this users can narrow their search ads within their geographical territory. Warning: We do not recommend adding more than 1000 locations if you use shared hosting. Otherwise, your website will work very slow. This is probably the easiest and fastest way to add multiple locations. What you have to do is to choose a location (Continent, Country, State/Province, County/Region or City) and press Import to import its sub-locations. and then click Import, it will add Barcelona, Girona, Lleidia and Tarragona to your locations. Then, you can add the sub-locations of a location. If you have added Barcelona in your locations, click Browse on the right of this location. and click “Import” to add all the sub-locations of Barcelona. If you are trying to import geolocations but you can see just empty dropdown menus like the screenshot above, you need to review your SSL certificate configuration. For websites hosted on yclas.com, login to your Cloudflare account, press the Crypto tab and disable Always use HTTPS. If you using Yclas Self-Hosted, please make sure you follow the instructions of this guide correctly. 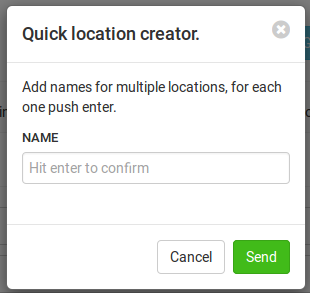 At the quick location creator, add the name of the location, hit enter on your keyboard and when you have done, press the ‘Send’ button as explained in the following screenshot. Name: Choose a name for the location that will be displayed, eg. city or city quarter. Basically, this field is the most important, the rest is kind of optional. Parent: Choose under one of the existing main locations, where the new location will be displayed. Choosing the Home Location while make it the main location. Locations can be easily moved to other parent locations. Seoname: A seoname will be auto-generated based on the name, but you can change it if you want it to be different. Description: You can add a few words about the place. 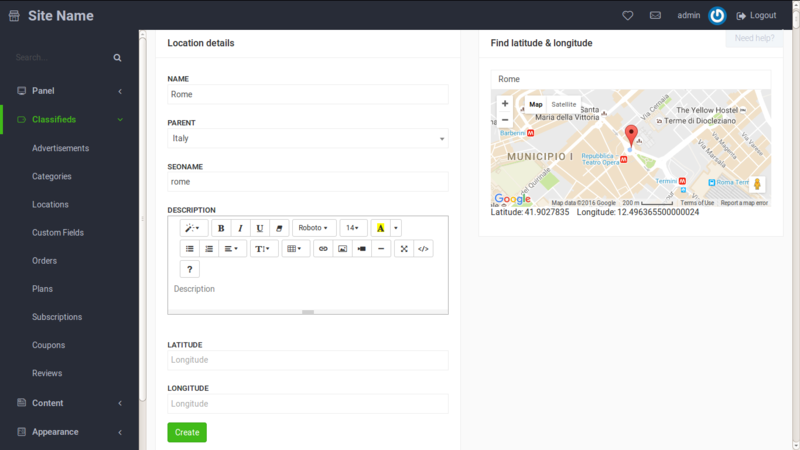 It’s possible to add manually the Latitude and Longitude of the location or enter the name of the location and find latitude & longitude automatically. Continue creating new locations if necessary amd remember to delete cache after finishing to see the changes. To delete cache go to: Extra > Tools > Cache and press the button Delete all. New locations now will be available to choose in Publish New Advertisement form and visible in ‘Locations’ widget. You can also add locations by importing them. Use this example file to create yours and simply import locations into your website. For more information, follow this guide. With our 2.4.0 release you can add sub-locations fast and easy. All you have to do is to click Browse next a location to insert sub-locations in that location. Like before: go to Panel, choose Classifieds > Locations on the left sidebar. Managing them is very easy. If you want to move locations and change their order you just need to drag and drop selected one to the chosen place. To change something, e.g. name or description of the location, you can click the Edit button. To delete press the button with trash bin. Note that when you delete parent locations inside of it, it will be moved to level up - to the parent of the deleted location. How to add categories and manage them?